Can you iIdentify this small tree please? 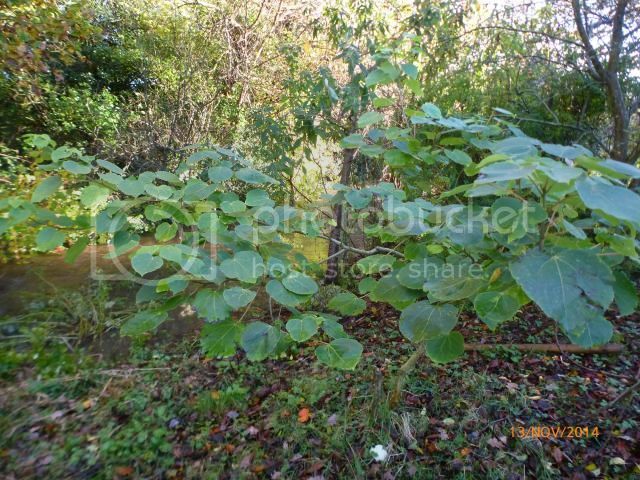 Posted: Fri Nov 14, 2014 7:50 am Post subject: Can you iIdentify this small tree please? I planted this about 10 years ago, it is still only about 5 or 6 foot high, I have an idea of what it is (and will say no more for now) but I don't know if it could be something else. 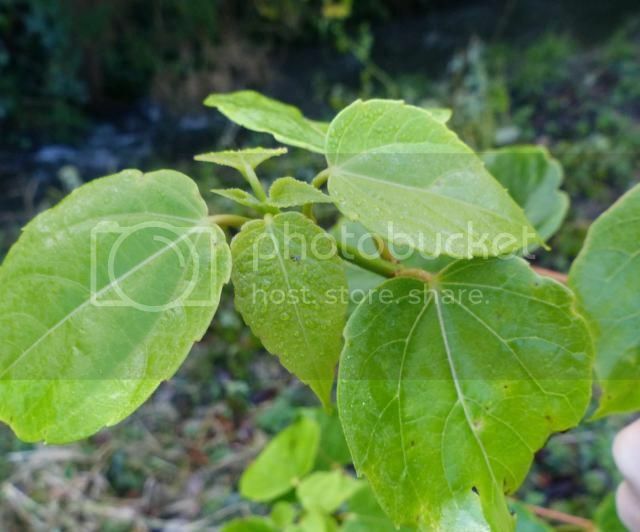 Leaf shape/size of shrub indicates Cercis sp. You need to look out for the flowers in spring...which will appear on bare branches before the leaves open. Does this agree with your ides for what it is? 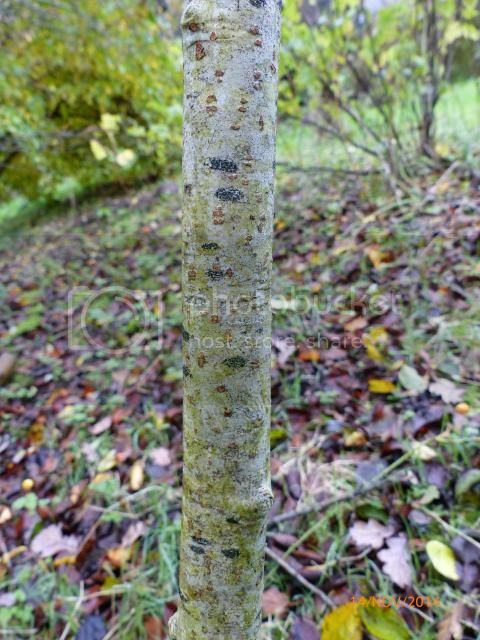 Only other thing with leaves like that is Cercidiphyllum japonica, but in 10 years that would be far larger...a tree. I was thinking it Might have been Idesia polycarpa, although this morning I have been comparing leaf shapes and growing conditions with the cercis and wondering if there was anything else I should be looking at. I planted it in a place sheltered from wind and must have thought it wouldn't get too big as it is not far from the house, in part shade. I have been wondering about it this year and yesterday was out taking photos of the high water levels. I am usually glad to let things grow away and the name will come to me one day, but I have been thinking that it may be in too much shade and wondering if it will need shaping or the trees near it cut back a little. Don't think leaf is right for Idesia polycarpa. 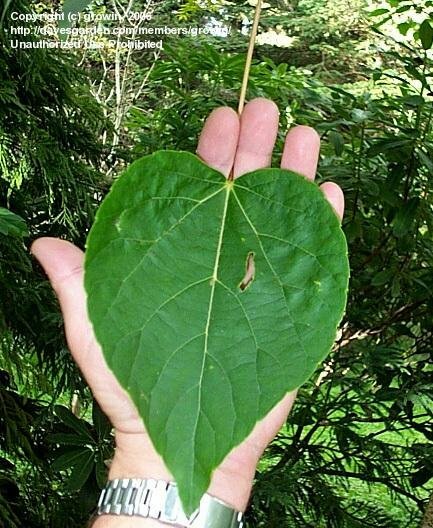 Idesia leaves are large.. quote wiki..."The leaves are large, heart-shaped, 8–20 cm long and 7–20 cm broad, with a red 4–30 cm petiole bearing two or more glands; the leaves are dark green above, glaucous below, and have a coarsely serrated margin". Cercis probably need sun to ripen the wood in order to produce the flowers the following spring. I must admit that I never dared to trim our Cercis. ..but have seen Cercis Forest Pansy pruned to form arches. Those leaf pictures are very good. 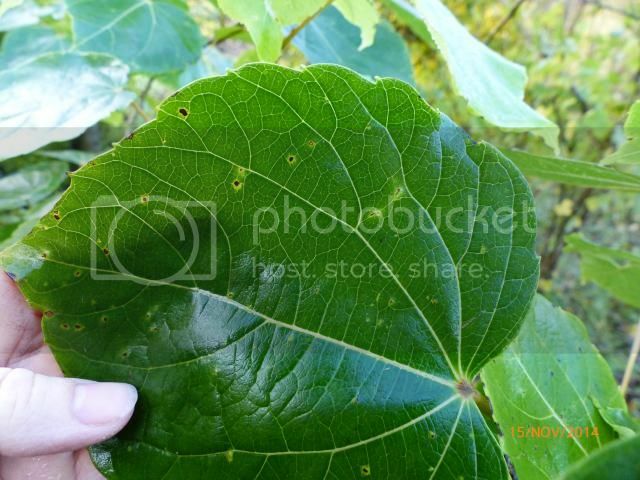 The leaf shape does look more like Cercis, more rounded, I had thought that the Idesia leaf looked slightly longer. The lack of autumn colour had confused me and I had it in my mind that Cercis had a smaller leaf but looking it up it seems to be 7-12cm long. 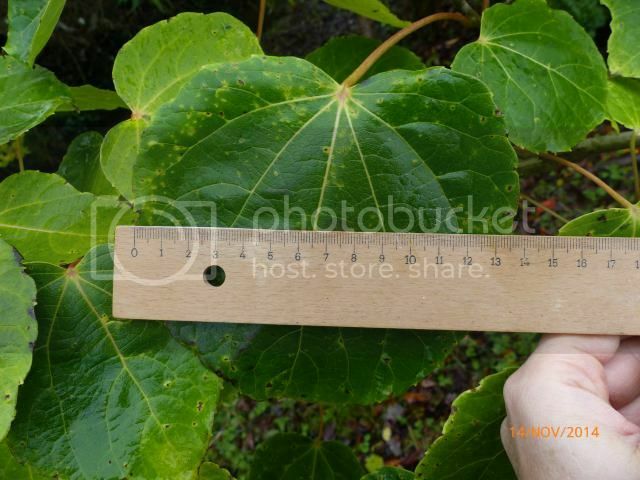 and the biggest leaves measured 13cm long. This picture is of one of the bigger leaves. I am so glad I asked and it is really interesting how discussing this and taking the pictures helps me to see features I was missing. I may try and give it a bit more sun! Yesterday, after initially looking at the leaf size and shape, it was looking more like a Cercis but as the day went on and I read about Cercis some things just weren't adding up. Being wet and dark so early yesterday I have only just taken more photos now. I read somewhere yesterday that Cercis doesn't have serrated leaves and that started me looking again. I'm sorry I didn't post better photos to start with. I should have known better as identifying trees simply by a poor leaf photo is not straight forward. 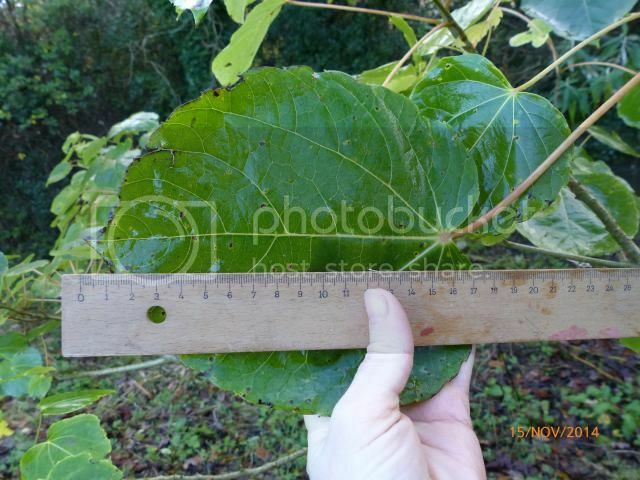 Leaf size, saw a couple of bigger leaves today at the top of tree, this one about 17 cm long. The young leaves are more elongated (the older leaves are rounder). 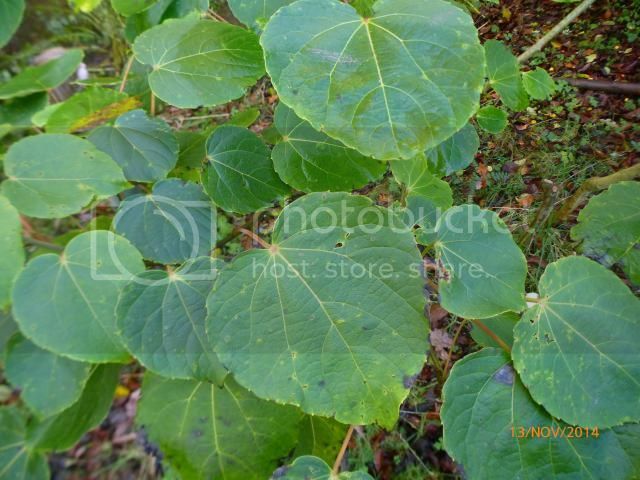 I am boggled eyed from looking at pictures of heart shaped leaves! the 4th picture down and also the picture of the leaf make me think that it could still be Idesia, but I have seen plenty of pictures that make me think it isn't Idesia too. Is it Cercis? what else could it be? So far as I know my tree hasn't bloomed yet but I will be watching out next year as this was a good summer and it grew well this year. I am trying to find something for you that will give a positive id. 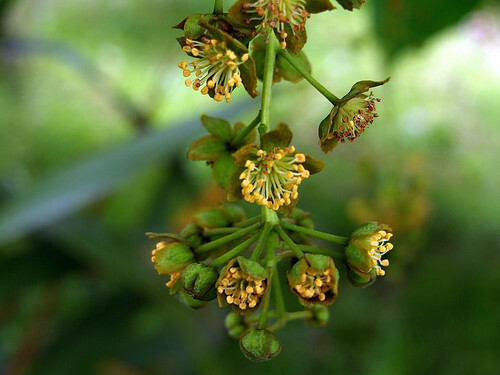 Idesia polycarpa is quite an unusual tree. 3rd pic of 15th Nov....New pics showing the young leaf certainly look more like Idesia. Idesia have glands on the leaf stalk but cannot find a good pic as example to post to show what I mean. Been busy... haven't had a chance to read my learned books yet. What ever it is it looks healthy! Thanks for the feedback Silver surfer, there's no rush on the id. It has been growing away slowly, most likely from a little bareroot whip (as that's how most things start here) with little more attention than noticing it is still growing. The last two summers have been good though. I did plant an Idesia, my notes say 9 years ago, but I don't note where I plant things (as I often move things in the first year or two) and I don't make a note of everything I plant. Garden habits I am trying to change! It definitely hasn't been cut back. 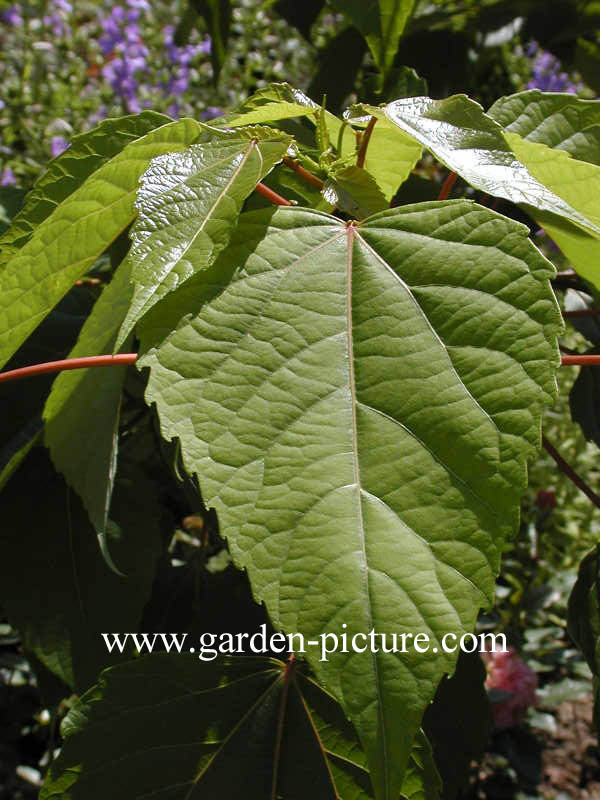 It comes into leaf relatively late, is growing happily in part shade and has no autumn colour. One of the clues for me is where it is planted. We began with very few sheltered sites in our garden and this tree was given a particularly sheltered spot (at a time when they were few), so I must have read that this "needs protection from wind". Also it was not planted in full sun, if the growing requirements suggested "needs full sun", then I would not have planted it there. I may have thought this tree would eventually be taller than that in front (a crab apple) and would receive full sun that way but it must have said "happy in shade" too. We do have a good growing climate here. A little tree fern (that was 10 euro, 12 years ago or so) has grown away happily without any winter protection even through the cold winter a few years ago, an olive tree the same, outdoors , no protection. I try and place plants so they are in the right conditions and am obviously better at that than remembering what they are afterwards! That is a very important clue...Cercis colour well in the autumn. Cercidiphyllum here have been bare for several weeks now...they are very early to lose their leaves. You need male and female trees to get the berries...apparently they have to be mature to produce flowers...20 years approx. Glad to have confirmation, it is extraordinary how many varying images there are for heart shaped leaves when there are so few trees with heart shaped leaves. Now to go looking for another one, or two? I wonder how to tell male from female when they are young? It sounds as if the flowers will be good for scent and bees so I may be happy with that anyway. Thank you again! I don't think you will be able to tell until it flowers. Then much easier to tell male from female. If I buy a little plant I won't know if it is male or female though, unless it was started from a cutting, so maybe that is an option. Well, I will look out for flowers next year and in the meantime look out for little plants.